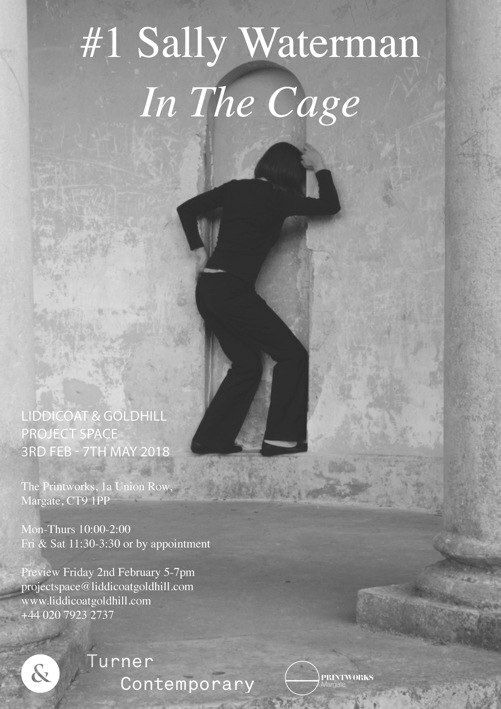 The inaugural Liddicoat & Goldhill Project Space exhibition showcases Sally Waterman’s video projection ‘In The Cage’ (2007). This piece takes its name from T.S. Eliot’s original title for Part II of ‘ The Waste Land ’ – drawn from Sibyl, the mythological figure in the poem’s epigraph, as well as Henry James’ novella. Parallels are made between the relationship depicted by James, Eliot’s troubled marriage and Waterman’s own experience of parental divorce. The visual metaphor of imprisonment evokes an inner psychological wasteland, where the non-communication between the poem’s speakers is interpreted as a series of gestures that are ‘acted out’ by Waterman herself. The figure, entrapped between two pillars within a sparse stage-like space, tries to negotiate her body within the recess at the centre of the frame. Her looped, recurring actions, set against a classical backdrop, reference the host of historical, mythological and contemporary female characters that occupy Eliot’s text, all bound up in repetitive cycles of mechanical tasks. The accompanying black and white photographic works from Waterman’s series, ‘Sermon’ , (2008-2009), also on display, refer to Eliot’s appropriation of Buddha’s ‘ Fire Sermon’ , which warns against the fires of passion that destroy people’s lives. The re-staging of imagined unfaithfulness and haunting reminiscences are performed and recorded through self-photography. Both ‘In the Cage’ and ‘Sermon’ were part of a larger practice-based doctoral project ‘ Waste Land ’ , which comprised twelve photographic and video installations derived from the poem. Through this work, Waterman emotionally embodies Eliot’s text –appropriating lines, concepts and images from ‘The Waste Land’ into her own fragmented biography. The five sections of Eliot’s poem represent different stages of the artist’s examination of her family trauma, through the therapeutic visualisation of repressed memory. Waterman adopts varying modes of self-representation, situating herself apart from the audience, appearing as an anonymous figure or a ghostly trace. This shifting subjectivity is reinforced through stylistic techniques of superimposition, speed-adjustment and repetition, that acknowledges the poem’s modernist context and bricolage structure. Sally Waterman, born Isle of Wight, UK, 1974, lives in London. She holds a BA (Hons.) English with Design Arts , University of Plymouth (1995) and MA Image & Communication (Photography) , Goldsmiths (1996). She received her Practice-based Ph.D. Media and Photography: ‘Visualising The Waste Land: Discovering a Praxis of Adaptation’ from the University of Plymouth, UK in 2011. Waterman’s video and photographic works explore memory, place and familial relationships through literary adaptation. Past group exhibitions and film festival screenings include Wolverhampton Art Gallery; Oriel Davies Gallery, Newtown, Wales; Pitzhanger Manor House and Gallery, London; Royal West of England Academy, Bristol; CCA, Glasgow; Aesthetica Short Film Festival, York; ViSiONA festival, Huesca, Spain and Moviemento, Berlin, Germany. Her work is held in public collections including The National Art Library at the V&A, London; The School of Art Institute of Chicago and the Yale Center for British Art, New York. She is a sessional lecturer at Ravensbourne, London and UCA, Rochester and is the founder of the research group, Family Ties Network. Liddicoat & Goldhill Project Space, at the Printworks Margate, is a flexible-use gallery / exhibition space. Our rolling programme begins February 2018.